100 Las Olas, is a luxury contemporary Ft Lauderdale Condo building of 46 stories located on Las Olas Blvd. Shopping, cafes, boutiques and some of the best restaurants in downtown Ft Lauderdale are all within a short distance of 100Las Olas. This Fort Lauderdale Condominium features with a roof top pool and health club on the 16 the floor. 100Las Olas features viwes of downtown and the waterways of Fort Lauderdale from the roof top ammenities.Vistas includes views of the Atlantic Ocean, Fort Lauderdale's New River and Las Olas Blvd which lights up each evening. Every unit has a spacious balcony with glass railings and interiors feature high end finishes throughout. 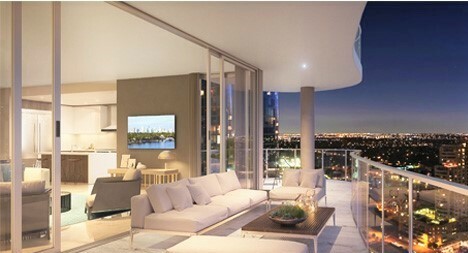 Looking for city living at its best now is the time to purchase your home at 100 Las Olas. Eric Miller and Associates, are always available to help you buy or sell real estate in the Fort Lauderdale Real Estate market and will be happy to show you 100LasPlace. For additional details, the latest update and to discuss the entire Fort Lauderdale Real Estate market contact Eric Miller directly at Contact us (954) 383-8170.